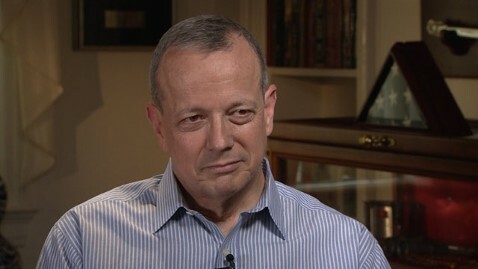 In an exclusive interview with ABC News' Martha Raddatz on "This Week", retired Gen. John Allen discussed the toll the Pentagon investigation into emails he exchanged with a Tampa socialite took on him and his wife, Kathy - who was suffering from auto-immune health issues. "Every phone call was pretty grim. And they were getting worse by the minute…For many years, I had told- Kathy, as we had dealt with these issues, that- the day that this becomes too big, I will drop my letter the next day. She wasn't going to tell me, but I was afraid where this would all end up [with her health]. And I finally made the decision it was time to go home," Allen said. The investigation into Allen, which concluded with him being completely cleared of any wrongdoing, took place after emails between him and Jill Kelley came to light during an investigation into exchanges between then CIA director David Petraeus and Paula Broadwell, his biographer. Petraeus later resigned after his affair with Broadwell became public. Allen told Raddatz the investigation led to personal reflection as he led coalition forces in Afghanistan. He retired last month turning down a NATO command. He now advises Secretary of Defense Hagel on Middle East peace talks. "I had to reflect on whether I could- I believed I could remain in command. And I believed I could. In fact, I felt an obligation to a duty to remain in command…I had to deal with- the realities of something that was going on back here. I won't- tell you that- that there wasn't a lot of pressure in that regard. But my sense of duty to the war effort, and more importantly, my sense of duty to the troops demanded that I remained focused on that," he said. "Any time you're investigated…and you have to remember back across three years- I hadn't- I didn't have any concerns about what was in the content of the e-mails…I was just interested in putting it behind me as quickly as we could," he said. Kathy Allen expressed surprise over the investigation into emails between her husband and Kelley, who she also was in communication with as well. She also discussed her concern about the pressure the investigation would place on her husband. "When someone shares an e-mail with her husband, you know, I thought, 'Is somebody thinking this is a little odd that, you know, they're taking this so seriously? '…I have a lot of faith in him. I have a lot of faith in our relationship…My biggest concern was for him because I thought, I don't know how he can run a war and then have this added pressure," she said. Allen later invited Petraeus to his retirement party - saying he couldn't retire without Petraeus and his wife present given the close relationship between the families. "Dave and Holly Petraeus are like family…given all that he and I had experienced together, and our families had had together, I couldn't retire without asking for Dave and Holly Petraeus to be present, " he said. Allen added that said he has not discussed the investigation with Petraeus. During the interview with Raddatz, Allen also addressed the current state of affairs in Iraq. "My fear is that we could see a polarization of the principle elements in Iraq…the increase in violence for all of us that served there, in particular those of us who served in the Anbar Province, which was a really violent area…We don't want to see it return to that." Raddatz asked Allen if the country would be more stable today had the United States kept a military presence in the country. "I don't think there's any question," Allen said.